You know alcohol damages your liver. 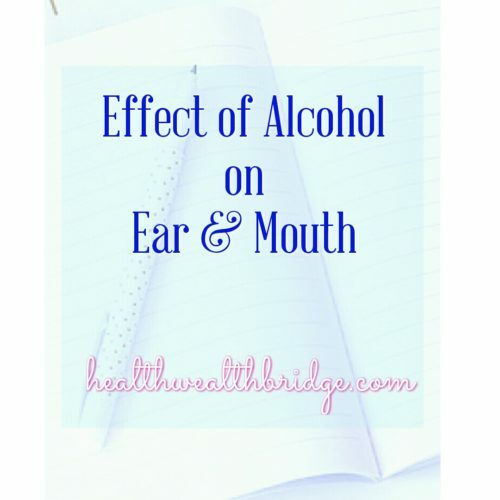 But do you know about ,the effect of alcohol on your ear and mouth ? Why does my ear have a ringing sound after drinking alcohol? Problem is the effect of alcohol on your ear . The acute toxicity of blood alcohol causes immediate and frightening effects. The delicate hair cells in your cochlea (the hearing apparatus) doesn’t like drinking alcohol . The cochlear hair cells change the sound waves into electrical signals.When the nerve of hearing relays these signals to your brain,you hear. The cochlear hair cells hate beer,rum,gin,vodka ..All alcoholic drinks. It hates it because ,alcohol is a cochlear haircell killer!This effect will add up overtime and you will hear less .Your ears will have more ringing sounds. Alcohols depresses the central auditory cortex (the main place in the brain where hearing is processed). This affect is long term.Happens with chronic alcohol abuse.Makes your brain shrink . But why would you care if cochlear hair cells hate drinking? You like how alcohol, makes you feel ,right? You do .You care in your guts ,when you are throwing up next morning. You care when you have a hang over. Your ears care ,because with time you are hearing less.The sad part ,you don’t even notice. The screams of the cochlear hair cells may initially present as a blocked, obstructed feeling in the ear. This feeling of obstruction is directly related with the amount you drink. Your liver can digest only small amount at a time .The rest circulates in the blood and affects different organs. This effect on your cochlear hair cells is initially temporary. It gets better with decreasing blood alcohol level.That’s why your ears will get unblocked after a day or two.The ringing stops.You hear perfectly. Over long time this toxic effect becomes cumulative.The ringing also known as Tinnitus will go on. You will hear less and less . 2) Try to stop drinking before your ear gets blocked/or before the ringing starts .The liver can handle about 1 ounce of alcohol in one hour.Drinking quickly, binge drinking,drink in in empty stomach can all increase risk. 3) You drink occasionally,but still having these problems.Start a detox diet. 5)Probiotic can help make your liver healthy.This in turn helps to clear the alcohol from blood . The report will tell you the damage your ear has suffered . How does alcohol affect your mouth? Alcohol can cause various problems in the oral cavity . It has a synergistic effect with tobacco as a risk factor for head neck cancers. Cancers of oral cavity oropharynx ,larynx are all possible with alcohol consumption. Together with smoking, the risk is much more than simply additive . The risk appears dose dependant. Drinking alcohol damages the oral mucosa .It causes carcinogenic changes over time. The effect is due to both ethanol and it’s metabolite acetaldehyde. Gum problems,caries are all common with poor oro-dental hygiene ,associated with alcoholism.But head neck cancers are the scary ones. Chronic alcohol users :Higher risk of oropharyngeal and laryngeal cancers. 1 to 5 and review with your otolaryngologis regularly. Design your own healthy lifestyle.Live healthy.Live strong. Comment below to let me know ,what effect of alcohol you have experienced? Disclaimer :Health information provided here is meant to help and spread awareness. It is not to be taken as professional medical advice. very informative and intuitive post about ill effect of alcohol. Love this post! THIS IS SUCH AN INFORMATIVE POST AND I WILL SHARE THIS POST THROUGH SOCIAL SITES AS WELL TO MAKE PEOPLE AWARE OF THIS! I don’t drink alcohol drinks (and if I am it is very rare) but this tips and information and very helpful. I should pass this to my drinker friends! This was a really informative post! I’m not a drinker anymore (more so in my college years) and I can kinda see how that would have an effect on your ears. Never had this problem but I got to ask my hubby, if he experienced it. Interesting article though. I drink alcohol occasionally though I’ve never experienced this personally. Thanks for the information and creating awareness! Hi Ana ,Ocaasional moderate amount of alcohol rarely causes the ear symptoms.But about the oral cavity symptoms data is cloudy .Moderation is always helpful. Ocaasional moderate amount of alcohol rarely causes the ear symptoms.But about the oral cavity symptoms data is cloudy .Moderation is always helpful. I’m a social drinker and well aware of the risks, that’s why I do it in moderation. Some people just abuse alcohol and I always feel bad for their poor liver. You are right Jules social drinking in moderation rarely causes problems.Its only when it suffocates the life out of life.thats when the problem starts.Thanks for reading. Great information and Interesting as well! I don’t drink alcohol and never experienced this! It’s good to know uou don’t drink.I am glad uou found it useful. It’s good to know uou don’t drink.I am glad you found it useful. This is really interesting! I’ve heard about the probiotics before…great article! Thanks for this informative post! I do hope other people can read through this or at least relay the message. While many people really loves drinking, I think they will still enjoy doing so even if taken with moderation. Thanks Sophie.You are right. Alcohol when taken in moderation,some damages can be limited. Ultimately it’d your life and you have to choose.Live healthy …or not. I don’t drink alcohol but it was an interesting read. I never knew alcohol could affect one’s ears. Hi Izabela,few people care about their ears when they are drunk.But alcohol can affect everything in your body.It’s a good thing you practice healthy choices .Thanks for reading. Great info. We need to teach the newer generation about harmful effects of alcohol for a safe and better tomorrow ! You are absolutely right NamRata.Teaching by example is easier. That’s why we need parents to be aware.So glad ypu liked this. I think becoming parents make you more aware of choices.Thanks for reading. Great information. I am an RN and always love to learn more! I have nothing against drinking. I think my friends are funnier when they had a few. It helps loosen you up. I myself don’t drink so hopefully I won’t have hearing issue. Great tips. I never knew alcohol could affect your ears. I always thought it was the nightclub music making me deaf… now I’m not too sure.